Here is a link for a pattern. Print it from Adobe Reader. Make sure to set 100% scale or use an actual size printing settings. Then transfer the image onto your fabric. 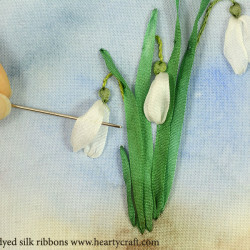 It’s recommended to use two layers of fabric for silk ribbon embroidery instead of one as you do for normal embroidery. This is because silk ribbons are heavier then embroidery floss you’re stitching with. 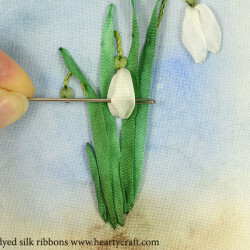 Place two pieces of cotton fabric one onto another and mount them together in a hoop that is fit to the size of the snowdrop image. Stems. 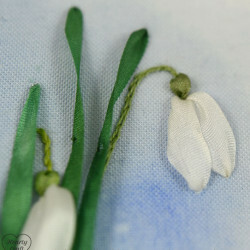 Stitch snowdrop’s stems using two strands of green embroidery floss. The floss shade should be lighter then green ribbon that is for leaves. I used 471 DMC floss. Work the stems with one stitch of you choice : a backstitch, a stem stitch, or a split stitch. Leaves. 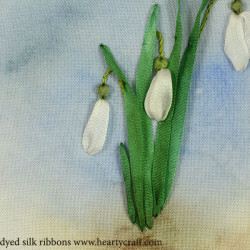 Using a piece of Dark Spring Green hand-dyed silk ribbon and long straight stitches create flower’s leaves. Let them twist a bit. 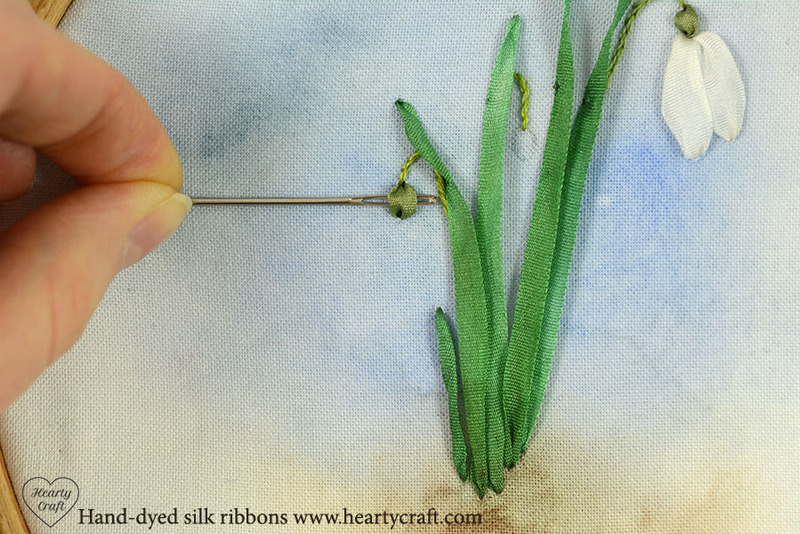 If the leaves do not stay in a position you want, attach them down with a few tiny stitches using one strand of green floss (see the photo below). Refer to a straight stitch tutorial as a guide. Calyx. At the end of each stem make a small straight stitch with Avocado Green silk ribbon. Pull the ribbon through very gently leaving a slightly looped stitch at the front. Hold a spare needle in the left hand (if you’re right-handed) to control the ribbon whilst pulling it through. Refer to a straight stitch tutorial as a guide. Flowers are also worked with straight stitches. 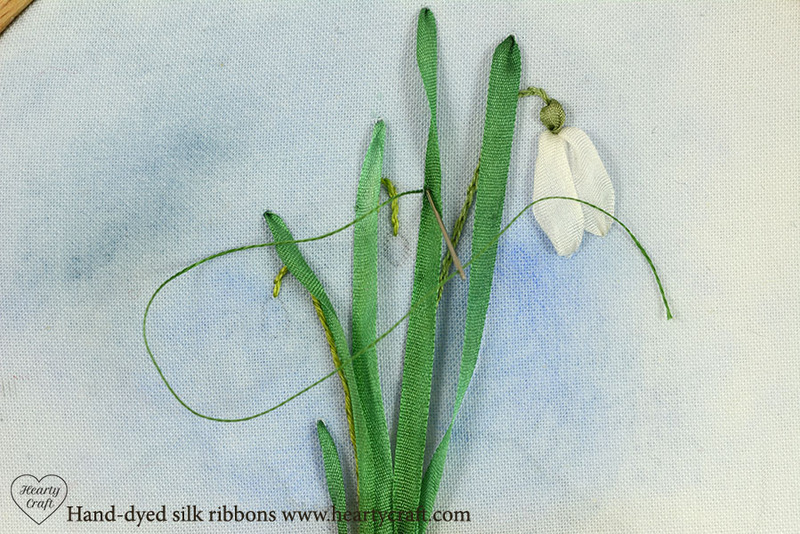 Thread the needle with 7mm wide white silk ribbon and stitch a middle flower making two straight stitches overlapping each other in a half. 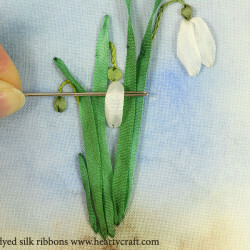 Use a spare needle in your left hand to guide the ribbon so the petals are curved inwards and raised, not flat. Stitch the right flower in the same manner, but make two petals with smaller overlap (see photo on the left). Left snowdrop has three petals. Start with stitching a petal in the middle. Gently tight the ribbon to get the petal as flat as possible. Then stitch petals on both sides of it. Make those ones curved inwards and raised over the fabric surface with a help of a spare needle as you did before. Let the petals also overlap slightly. Thank you Brigitte! I’m so glad you like it! 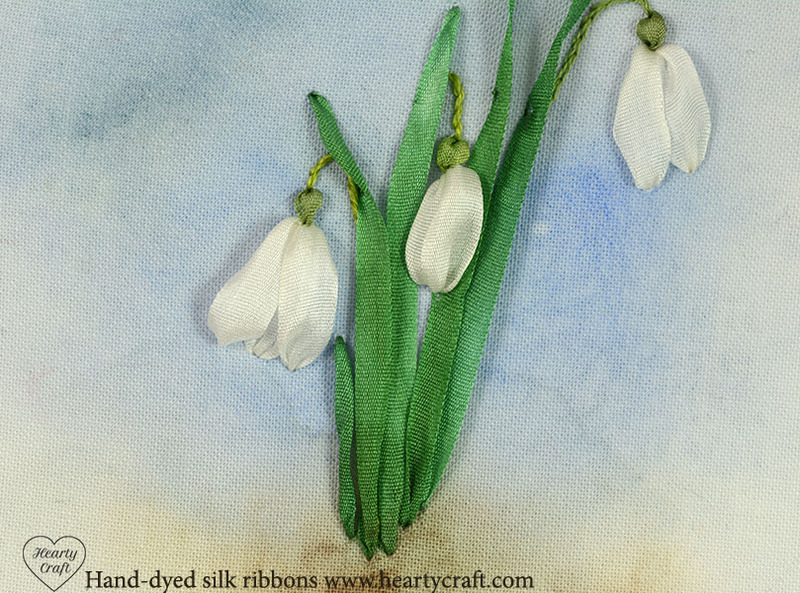 Have just use this on a 90th birthday card for my Mum as snowdrops re her favourite flower. Am hoping she will be as pleased with it as I am. That’s a great idea to make a card, Lynda. 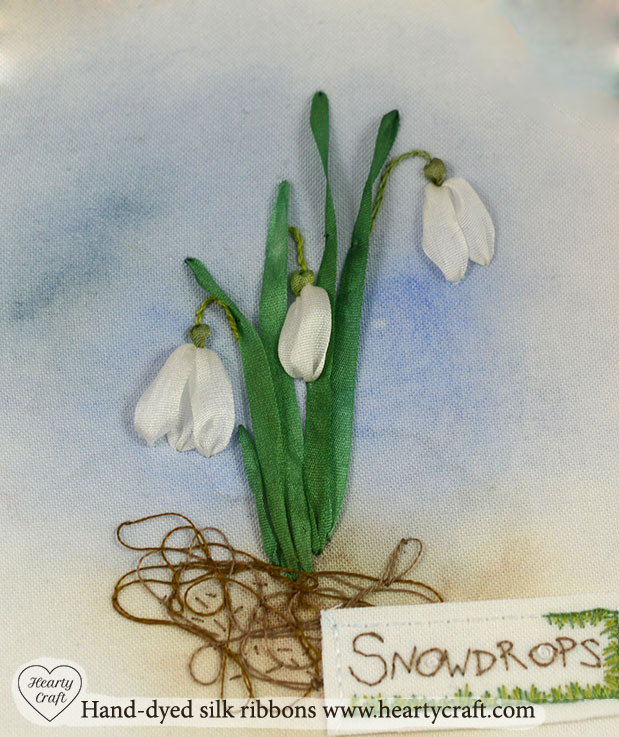 I might put my snowdrops out of a frame and make a card too.